It is a heavy burden for married couples not to be able to conceive and bear children. That is true today in our society, and it was certainly the case for Jewish couples in the first century. Zechariah and Elizabeth had waited a very long time for God to bless them with children, and they had likely given up hope at their advanced age. When the Archangel Gabriel told the priest Zechariah, as he was serving in the Temple, that God had heard his prayer and they would have a son named John who would be a great prophet, Zechariah responded with skepticism. He asked “How shall I know this? For I am an old man, and my wife is well advanced in years.” (Lk 1:18) Instead of remembering how God had done something quite similar for Abraham and Sarah in their conception of Isaac, Zechariah doubted. As a result, he could not speak until the birth of his son. When months later the pregnant Theotokos visited the pregnant Elizabeth, the older woman recognized the Savior and His Mother, exclaiming “Blessed are you among women, and blessed is the fruit of your womb!” John even leaped in her “womb for joy” when they arrived. (Lk 1: 42) After Elizabeth gave birth, “her neighbors and relatives…rejoiced with her” in response to God’s great mercy and blessing to the woman who had been barren. (Lk 1:58) When it was time to circumcise the baby on the eighth day, Zechariah wrote that the child’s name was to be John. That was when his speech was restored and he proclaimed “You, child, will be called the prophet of the Highest; for you will go before the face of the Lord to prepare His ways, to give knowledge of salvation to His people by the remission of their sins, through the tender mercy of our God, with which the Dayspring from on high has visited us; to give light to those who sit in darkness and the shadow of death, to guide our feet into the way of peace.” (Lk 1:76-79) Things had turned out very differently for Zechariah and Elizabeth than they, or anyone else, had expected. The reaction of the disciples shows that they knew Christ had blessed them for something larger than their own immediate satisfaction. Notice that they did not simply take all those fish to market in order to make a lot of money. They did not ask the Savior to become a partner in their business as a fishing guide. No, they left it all behind in order to offer their lives to the Lord, even to the point of death as martyrs. The same is true of Zechariah and Elizabeth, for the miraculous conception of their son did not occur so that they would have someone to care for them in their old age or extend their family line. A couple of years later, Herod’s soldiers murdered Zechariah when they were trying to kill John after the birth of Christ. Elizabeth died forty days later, and their son grew up in the wilderness as he prepared for his unique ministry of calling Israel to repentance in preparation for the ministry of the Savior. The examples of Zechariah and Elizabeth, as well as of the fishermen, remind us of the importance of persistent faith and obedience. All had seemed lost both to an elderly couple without children and to professional fishermen who knew that even their best labors had failed. It made perfect sense for Zechariah and Elizabeth to despair of ever having children. 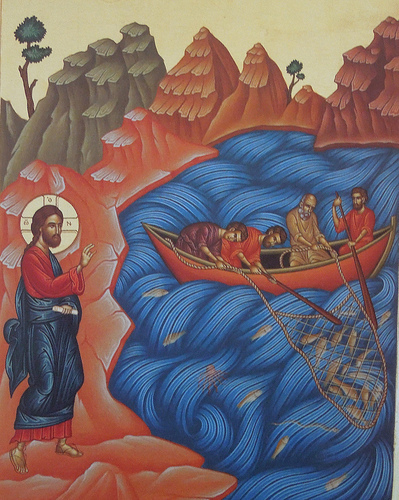 It was entirely understandable why Peter, James, and John had gotten out of their boats and begun to wash their nets. Likewise, it is not at all surprising when we despair of ever finding healing from habitual sins that have held us captive for years, perhaps as long as we can remember. It may seem only reasonable to think that our broken relationships will never be healed or that we will never have the strength to respond to the persistent challenges of our lives in ways that bless others and bring peace to our own souls. It may seem entirely rational to give up and accept our spiritual barrenness as simply the way life is. To do so, however, would be to abandon our Lord, Who against all experience and knowledge of how the world works, rose from the dead after three days. It would be to step outside the blessed story of how God has brought salvation through an unlikely cast of characters that includes elderly, infertile couples and rough fishermen. They did not have perfect faith, for Zechariah doubted the message of the Archangel and the disciples misunderstood the Savior until He opened their eyes after His resurrection. But despite their clouded spiritual vision, they stumbled along with the obedience of which they were capable. After decades of frustration, the elderly couple offered themselves to receive the blessing of a child. After a long night of empty nets, Peter and his partners let them down one more time into water which they could not imagine contained any fish. Against all odds and contrary to everything they had learned to expect in the world as they knew it, these people had the surprises of their lives when they opened themselves to receive the Lord’s blessings through persistent obedience. The conception of John the Baptist and the miraculous catch of fish were not instances of people trying to use God to make them happy on their own terms. Zechariah and Elizabeth died when their son was quite young, and John the Baptist was killed for fulfilling his prophetic ministry. 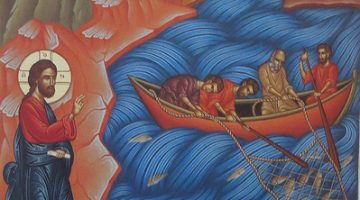 Christ used the great catch of fish to call Peter, James, and John to abandon their nets and follow Him as “fishers of men” in drawing others to the salvation of the Kingdom. Their great blessings were also callings that required profound self-denial. We must learn from their holy examples that the same is true of our lives. God does not bless us in order to make us happy on our own terms, but in ways that require obedience for the healing of our souls. We should all count and give thanks for our blessings every day, even as we prayerfully discern how to use them to fulfill the Lord’s purposes for the salvation of the world. That will require the persistent faith and obedience of those who know that our lives are about something far more profound than satisfying our self-centered desires. It will require a refusal to give up when all appears to be lost and we can see no sign that anything will come from casting out our nets just one more time. It will require the humility to see that the story of our lives is not all about us, but about what our Lord is doing through those who lack the ability to save themselves. There is no other way to open our souls to the blessing of the One Who alone can turn our barrenness into abundance and fill our empty nets to the point of breaking as He draws us into the new life of the Kingdom. You are most welcome! Thanks for your kind message.